The Lumia 435 comes with a dual-core Cortex-A7 processor and 2MP cam, while the Lumia 532 model packs a quad-core Cortex-A7 CPU and 5MP snapper. 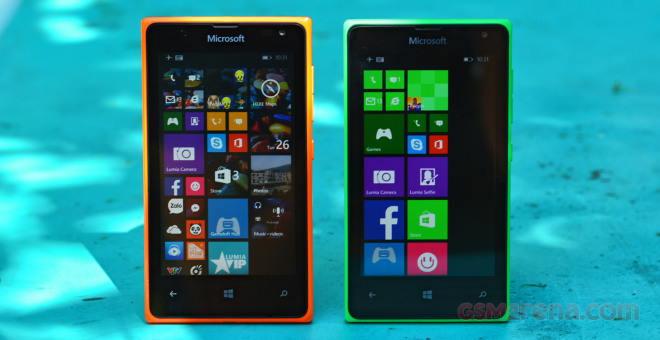 Both run on Windows Phone 8.1 with Update 1 and are powered by 1,560 mAh batteries. We expected the phones to perform quite similar in our battery tests, and indeed they did. The Lumia 435 did great at our 3G talk time test scoring 10 minutes short of 16 hours, while the Lumia 532 lasted 14 and a half hours. The 4″ displays of the Lumia duo isn’t the best solution for video playback, but on the battery side of things the devices did decently, both lasting north of 8 hours before their batteries dropped down to 10%. 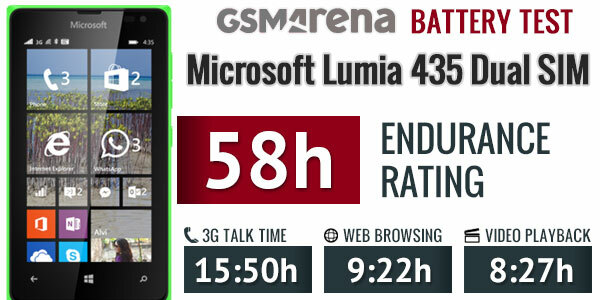 We got the dual-SIM flavors of both Lumia smartphones and their standby endurance was OK for such small batteries – 7 days for the Lumia 435 and 5.5 days for the Lumia 532 with the Glance screen turned on. 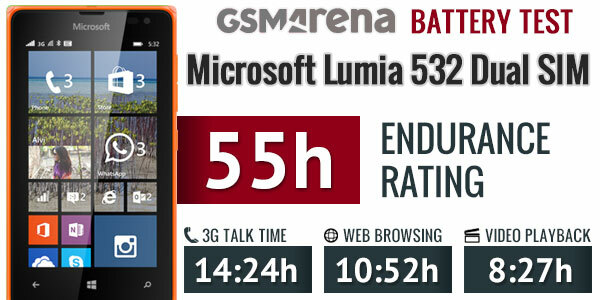 If you disable the Glance on the Lumia 532, you’ll get the same endurance as the 435 model. So, the dual-SIM flavor of the Lumia 435 is good for 58 hours straight if you use it for an hour of 3G talks, an hour of web browsing and an hour video playback each day. You can squeeze 6 more hours up to 64h endurance rating by using just one SIM card. As we mentioned, the Lumia 532 had its Glance screen turned on, so its dual-SIM endurance dropped down to 55 hours, which is still a decent achievement. By dealing away with one of the SIMs you’ll get an additional 5 hours for a total rating of 60 hours.